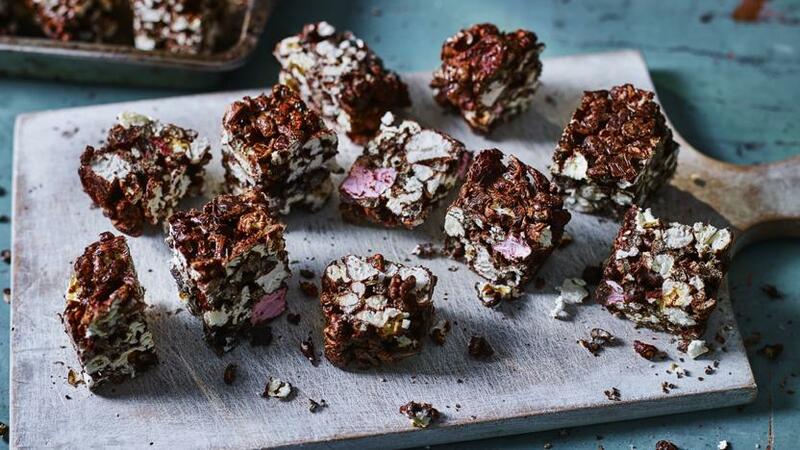 Puffed rice and salted popcorn bars are a revelation. Make a batch to share with friends or colleagues. The bars will keep for up to a week in the fridge. Each serving provides 90 kcal, 1g protein, 13g carbohydrates (of which 9.5g sugars), 3.5g fat (of which 2g saturates), 0.5g fibre and trace salt. Line a 20cm/8in square baking tin with two layers of cling film. Melt the chocolate in a heatproof bowl over a pan of barely simmering water, making sure the bottom of the bowl is not touching the water. Meanwhile, put the rice cereal, popcorn, cranberries and marshmallows into a bowl and mix well. While the chocolate is still warm, quickly pour it onto the cereal mixture and stir with a rubber spatula until everything is coated. Transfer the mixture to the lined baking tin and press down well. Cover with cling film and place in the fridge to set for a minimum of 2 hours. Turn out onto a board and cut into 20 squares, to enjoy when you get a sweet craving. The bars will keep for up to a week in the fridge.